Ashoka Arts was established in 1994 aiming to provide an online shop for our antique swords and weapons store, previously based in the heart of Londons Portobello Antique Market where we traded for several years. 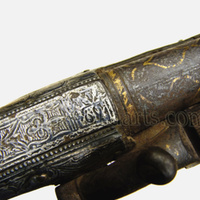 Selling at select Antiques and Arms Fairs as well as online, we offer the collector and dealer a range of fine historic weapons including antique swords, collectible knives and daggers, antique spears, polearms, antique guns & pistols, arms & armour and other items relating to the militaria market. 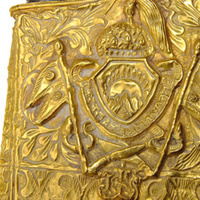 All of the swords, weapons and items offered within these pages are guaranteed antiques and we can provide a certificate of Authenticity if required. We take a pride in offering good quality antique pieces to collectors, if there is an item you are looking for do let us know and we will try and help source it for you. 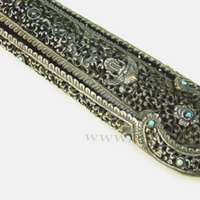 We specialise in selling fine quality Indo-Persian and Islamic swords. Our items are carefully selected for the enthusiast and quality and rarity are of utmost importance for the pieces we offer. Our shop offers antique weapons from all around the world from Keris and klewangs from Indonesia, Barongs and weaponry from the Philippines, Thai and Burmese Dha swords from South East Asia, Dayak mandau swords from Borneo to Uzbek and Caucasian shamshirs and shashkas. In our online store we are able to accept payments from all major credit cards, we also can accept most other forms of payment, please contact us if you wish to pay via bank transfer or have enquiries about any other payment methods.